USDA Plant Hardiness Zone 6 is brrr chilly in winter. Historically, its average coldest minimum winter temperature is -10 degrees F -- just 10 degrees warmer than the zone 5 average. The USDA divides all of America into 13 winter climate zones with zone 1 being the coldest. It further divides each zone into "a" and "b" areas with "a" being the coldest. For more about USDA zones, please read Getting Started: USDA Plant Hardiness Zones. The interactive USDA Plant Hardiness Zone Map uses two shades of woodland green to indicate zones 6a and 6b. At Flowers by the Sea, we use the broader classification of the zone number and do not use the subzones indicated by the letters "a" and "b." This is because many factors affect a sage's success -- such as microclimates and beneficial placement in a yard -- and some may be more important than a half-zone difference. Think of zone 6 as a belt curving under the belly of chillier zone 5. Beginning in north central Washington, zone 6 swings downward through the Pacific Northwest into the Southwest, then across the northern tip of the Texas Panhandle through the lower Midwest. From Kentucky and Ohio, it travels north to the southern peninsula of Michigan and also swings northeast to Massachusetts. The kind of Salvias appropriate for a zone 6 garden partly depends on whether you want to plant them as perennials or annuals. Gardeners in cold-weather zones often grow many Salvias as seasonal bedding plants, such as varieties of Tropical Sage (Salvia coccinea 'Forest Fire'). For more information about Salvias as annuals, please read Getting Started: Annual, Perennial and Shrub Sages and Portraits in Gardening: Michael and Kathi Rock's Hummingbird Journey. For example, due to its position in a large inland basin tucked between the Cascade and Rocky Mountains, eastern Washington has hot summers and lower humidity than along the coast. Eastern Washington also has some of the richest, loamiest farm soil in the nation. So if you live there, you would choose sages that can tolerate heat, cold, rich soil and low-water conditions but not necessarily drought. Given all these factors, you likely would be successful growing the spectacular perennial Bicolor Szechuan Sage (S. sp. from Szechuan) as long as you provide partial shade and some supplemental watering. However, the plentiful rainfall in Zone 6 Ohio or New Jersey would be better for a water-loving Japanese perennial, such as Kyushu Woodland Sage (S. nipponica 'BSWJ5829'). Considering all the cultivation factors necessary for a successful flowering landscape can be overwhelming, especially if you are a new gardener. But our Salvia Finder tool can help you sort choices based on local conditions and personal preferences. Coast to coast, mountain to plain, desert to swampy lowland, FBTS receives feedback from customers. Please call or email us with any questions you may have about our plants. 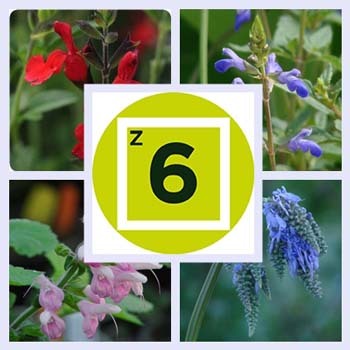 We're ready to help you get started growing Salvias and companion plants in your zone 6 garden wherever you live.